Calling all runners, aspiring athletes, and kindness heroes! Are you ready to #GetKind and pass some mile-markers of your own? We are too! 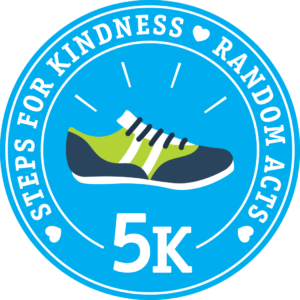 This October, we’ll be launching our first ever virtual 5K race, called Steps for Kindness, in tandem with Homeboy Industries, a Los Angeles-based nonprofit that serves high-risk, formerly gang-involved men and women with a continuum of free services and programs, as well as onsite job training — and we’re hoping you’ll join in on the fun. 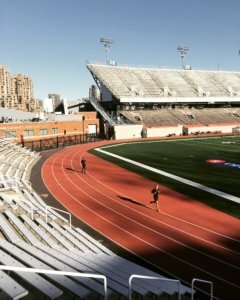 Of course, if you’ve never heard of a virtual 5K before, you’re probably wondering what it’s all about. That’s okay! We’ve got the answers here. A virtual 5K is pretty much what it sounds like — a 5K race (that’s around 3.1 miles, for all the non-metric savvy out there). The difference between a regular foot race and a virtual one? Simple: location, location, location (and okay, time and date, but mostly location). 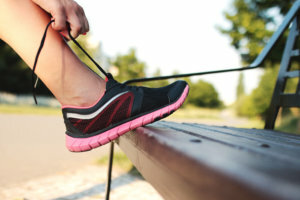 In a virtual 5K, participants can take part in the event from anywhere, whether that means on their treadmill at home, along their local running trail, or at the nearby public track. (You can also technically chase your kids around the backyard as many times as it takes to achieve the 5K, although we don’t recommend it. Too many lawn toy obstacles.) If you can’t run the 5K, you can also walk it or cheer on a friend! According to Virtual Strides, the outlet through which our two nonprofits will be completing our 5Ks, it’s simple: Participants register for the run online, complete the distance anytime and anywhere, then upload their finish time to the portal website as instructed. All participants will receive a finisher’s medal afterward, or at the end of the race period. In short, you’ll be completing a 5K on your terms, where and when you’re able, even if that means over a few separate days. Wait! I’m Not Able To Run 5K (3.1 Miles) In One Go! That’s okay! As mentioned before, in a virtual 5K, you can complete the event on your terms. That means that if you need to, you can split the race up into three or four (… or five or six) different sessions, so that the distance isn’t too taxing for you; walk it at your own pace; or as previously mentioned, sponsor a friend to run it for you. We want everyone to be able to join in however possible. I’m Ready! When Can I Sign Up? Hold your horses there, friend (and if you have real horses, we’re sure they’ll appreciate it). Registration officially opens on Oct. 8 and will close on Nov. 13. We know you’re busy, so we’re keeping things up and running for as long as possible. (Pardon the pun.) Make sure to mark your calendars! How Much Does The Virtual 5K Cost? For this year’s 5K, participants will pay an entry fee of $23 USD during the early registration period (Oct. 8-14). After that, between Oct. 15 and November 13, participants will pay an entry fee of $25 USD. Is There An Actual Footrace Involved? Yes! Homeboy Industries will be hosting an official, in-person 5K race on Oct. 22, 2016 in Los Angeles. If you’re interested in signing up and will be present in Los Angeles that morning, head to the Every Angeleno Counts race website and register there; Proceeds from the in-person race will benefit Homeboy Industries. Will There Be Any Local Run/Walk Meet-ups? Yes! 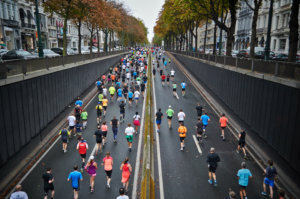 There will be a small number of meet-ups organized and led by Random Acts staff, so supporters in a particular area can run or walk the 5K with a group. See below for the most up-to-date list of locations. Details will be added to this page as events get organized. Saturday, October 22, 12pm-4pm CDT at Lake Phalen, Saint Paul, Minnesota. Details. Saturday, October 22, 10am-1pm EDT at Rock Creek Trail, Bethesda, Maryland. Details. When Will Medals Be Distributed? Is There A Ceremony? There’s no official medal ceremony involved (unless you set one up with your dog in the living room of your apartment, in which case, please send photos). All of the custom-made Random Acts medals will be mailed out after you’ve uploaded your race results to the Steps for Kindness Virtual Strides portal, or at the end of the race period, whichever comes first. Whatever your situation, no matter how far you can run in one go, or how long it takes you to get there, we know you can achieve this, even if you’ve never run a 5K before. You’ve got some time left to train, so go ahead and get those sneakers laced up — we’ll be waiting for you at the starting line in October!